Hart Marx Advisors is a consulting firm that assists buyers and sellers in the automotive and heavy-duty industries with mergers and acquisitions (M&A) transactions, along with capital formation for private equity placements. A highly-experienced team of specialists provide buyers and/or sellers with a full range of services, including: M&A strategy, planning, investigation, buyer/seller identification, negotiations, due diligence support and integration. With locations in Folsom and San Rafael, CA; Bloomfield Hills, MI; Jacksonville, FL; and London, UK. www.hartmarxadvisors.com. Marx Group is a full-service marketing communications agency highly focused in the automotive, trucking and tech industries, offering a diverse range of services tailored to fit client needs. Marx Group delivers strategic marketing campaigns to help its clients drive sales, increase market share and grow their businesses. www.marxgrp.com. Barbeau Consulting LLC has been providing business improvement advice to companies in the automotive aftermarket. 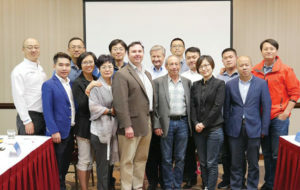 Dave Barbeau has led the global aftermarket for two premier Tier One automotive manufacturers; he is considered an expert in the China aftermarket having spent much time building businesses there and in consulting with Chinese based companies. Barbeau Consulting is a Strategic Partner with AMInsight.www.barbeauconsulting.com. Co-founded in March 2018 by Maggie Xu and Lilly Li in Shanghai, AMInsight was formed with the goal of being the leading professional exchange between the China automotive aftermarket and overseas resources, focused on the auto parts supply chain, including distributors, B2B e-commerce, auto parts retailers, service and collision chains and buying groups. (86)186 1689 2437.